The contingency framework will monitor issues as negotiations about Britain’s EU membership continue. THE IRISH GOVERNMENT has put contingency plans in place after the shock Brexit result saw Britain voting to leave the European Union. In a statement, the government said its contingency framework identifies key policy issues that need to be managed by government departments in the aftermath of the referendum vote. It is important to be clear: the UK has not actually left the EU. Until it formally withdraws from the Union, the UK remains a full member, with all of its existing rights and obligations. He noted that businesses can continue to trade as normal and people can continue to travel as normal between Ireland and the UK, including Northern Ireland. In a statement, the Taoiseach said that he is “very sorry” about the Brexit result, but he respects the British people’s decision. Kenny also wished Cameron well for the future, and reiterated that Ireland’s strong and close relationship with the UK will remain. 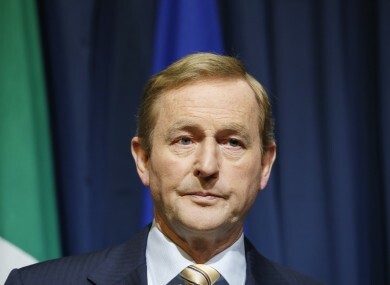 Kenny set out to reassure people in Ireland that the government had prepared for a possible Brexit. The main concerns for Ireland in the case of a Brexit relate to potential impacts for trade and the economy, for Northern Ireland, for the common travel area and for the European Union. The government undertook detailed contingency planning in order to “to protect and advance this country’s interests”. Kenny will brief leaders of the opposition on the plans later. He said that the Minister for Finance and his officials are in close contact with the Central Bank, the NTMA and international partners “to ensure that any short-term market volatility is carefully managed”. The pound sterling dropped more than 11.5% (17 cent) since voting closed at 10pm, which is a 31-year low for the currency. Sinn Féin have called for a border poll on Northern Ireland in the wake of the result. On the topic of the north, the Taoiseach said that the implications of Brexit for Northern Ireland and for relations between North and South “will require careful consideration”. He is set to meet with colleagues from the Northern Ireland Executive on Monday week at the North/South Ministerial Council for discussions on Brexit. One other area of concern is the Common Travel Area between Britain and Ireland, and the Taoiseach said the government will do its best to minimise any possible disruptions to this. Enda Kenny said that the government is also “acutely aware of the concerns which will be felt across the Irish community in Britain”, and assured people that it will also think of their during negotiations. Ireland will, of course, remain a member of the European Union. That is profoundly in our national interest. The European Council is set to meet next week. Kenny said that the contingency framework – which is coordinated by his department – will be an iterative process during the Brexit negotiations. The framework will enable the government departments to minimise potential risks likely to arise, he said. Priority issues in the framework will include UK-EU negotiations, British-Irish relations, Northern Ireland, trade, investment, North-South border impacts, competitiveness and macroeconomic issues, research/innovation funding and energy. “It is important to recall that Ireland – as a committed Member State of the EU – will work within the EU context,” said the Taoiseach’s statement. At the same time, Ireland has unique bilateral interests with the UK, including with regard to Northern Ireland, and the government will also have to work bilaterally in close contact with the UK Government and the devolved administration in Northern Ireland. The Minister for Foreign Affairs and Trade, Charlie Flanagan said the Brexit outcome “is certainly not the result which I or the Government had hoped for”, but reassured the government has “very much been prepared for both possible outcomes”. He has been in touch with Irish Ambassadors from key EU capitals to travel to Dublin to discuss next steps. Flanagan said that the government also want to keep engaging with the Irish community in the UK, as well as stakeholders such as Irish employers’ representatives and businesses. The Department of Finance said that it has been actively preparing for a Brexit, working closely with the Central Bank and the NTMA “to ensure financial and economic stability can be maintained”. It said that the economic and fiscal policies implemented over recent years “have placed the State in a stronger position to weather any prolonged economic shock that may be caused by this result”. Minister for Finance Michael Noonan TD said that he will be working to ensure that “we will seek to support the continuation of the important and mutually beneficial economic ties that exist between the UK and Ireland”. Email “Government puts contingency plans in place after shock Brexit result”. Feedback on “Government puts contingency plans in place after shock Brexit result”.